Today I reveiw beers. A most enjoyable task. Now I have to admit I am a fan of Magic Hat. 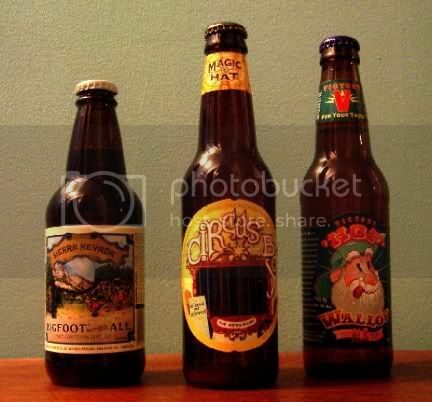 The Magic Hat Brewing Company is located in Burlington, Vermont and their #9 is a big favorite of mine. It has a bit of an apricot taste but not cloying or overly sweet. A nice beer for a summer day while sitting on your porch, if you have a porch. But this is about Circus Boy, something that I saw for the first time this morning when I went to get a cure for a session of vodka drinking last night (see my previous post). 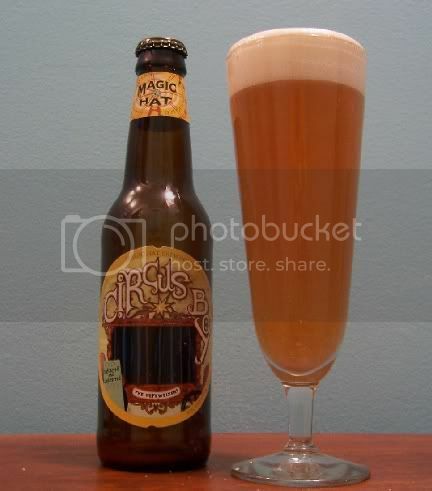 Circus Boy (I don’t know where they get their names) is billed as a hefeweizen and is an unfiltered beer so it is a bit cloudy but there didn’t seem to be any discernable yeast deposit on the bottom of the bottle. 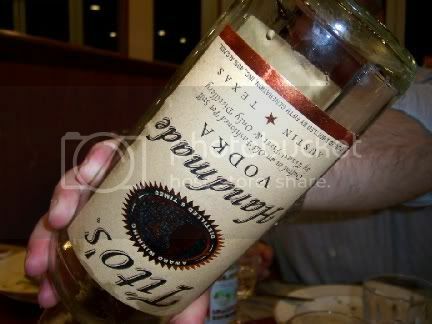 It has kind of a perfume-like taste to it but doesn’t really have a perfumed nose. In fact it tastes a lot better than it smells, although it doesn’t smell really bad, by any means. On the other hand, it doesn’t smell really good either. It certainly doesn’t call out for a squirt of lemon juice like many more traditional hefeweizens do and you also wouldn’t want to put any raspberry syrup in it like they often do to hefeweizens in Berlin. I guess if this was a wine you might call it amusing and unpretentious. 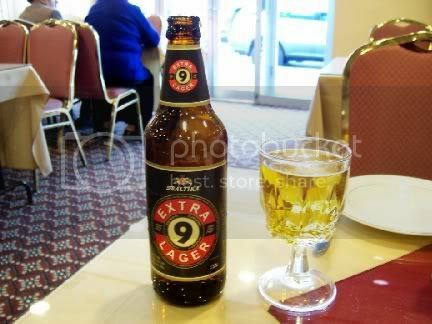 I think it would be a good beer to bust out along with the #9 at a barbecue just for something different. In fact, might sound a bit sexist here, a lot of women might like it as an alternative to wine coolers. Now don’t get me wrong, I will drink a wine cooler on occasion and Mike’s Hard Lemonade really hits the spot at times. If you want to visit an interesting, although somewhat confusing website, check out Magic Hat’s. Whoever designed it must have been a Monty Python fan. Well, a wallop it does pack, a hefty 8.5% wallop. Sneaky too, you don’t really notice how strong it is because it is really, really hoppy. 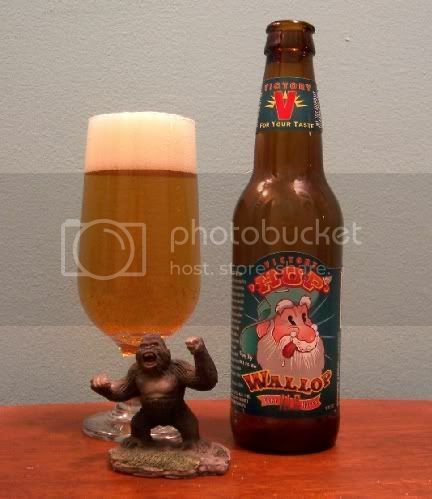 When you first pour it a nice head rises up that, as the bubbles burst, releases an almost fresh hops-like aroma. Sadly, the head dissipates quite rapidly and then the beer takes on an almost funky odor. However, the beer doesn’t taste funky at all. If you let it set in the glass a bit the funky smell goes away and you get the hops back again. Either that or the guy next to me farted just as the head went away. It is really quite good with a strong flavor of hops, quite dry, but not, somehow, overpowering. I quite enjoyed it, but then I like strong flavors and am partial to IPAs. This makes your typical IPA look a bit pale in comparison though. This beer is brewed by the Victory Brewing Company and is located in Downington, Pennsylvania. Victory is another brewery that makes a whole bevy of good beers. I am, as you probably know, a big fan of micro-breweries and even the larger ones that produce a product with some real taste like Samuel Adams (note, I am not a big fan of Anheuser Busch and their ilk). I certainly would recommend this if you like hops. If you don’t, run away. Well, if I thought the Victory Hop Wallop Ale was strong, this one is a real kick in the head, a whopping 9.6% alcohol. Despite a real heavy malty flavor the alcohol does come through, but not in an entirely unpleasant way. It is one of the few brews that I have ever had that actually warms the tummy on the way down. This also, to me at least, would be the perfect beer to end up a session with the boys and girls. I don’t think it would be wise to start out the evening with it though. Everything else would pale in comparison and you would be hard pressed to spend the night drinking these. I suspect it would be a rather short night if you tried. 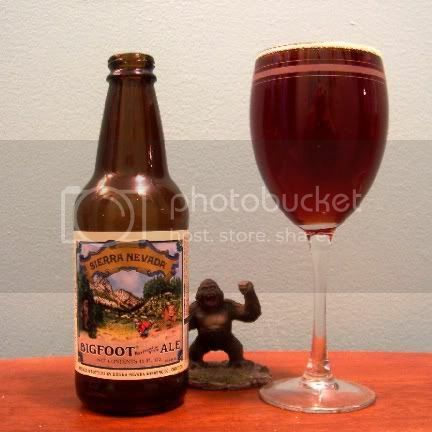 Bigfoot is made by Sierra Nevada, another reliable brewery that puts out consistently good beers. Despite its name it is actually located in Chico, California. If you like my reviews of beers let me know and I will continue to do them more frequently. I am certainly not going to do another 1000 bars but will, of course, continue to post on any new ones that I go to or any interesting experiences that I have in ones that I have visited before. I am not retiring, just slowing down. I might also do write-ups on interesting or classic and well-made cocktails that I either make myself or order in a bar. Your comments and emails are always welcome and let me know what you think about what I am doing and help me figure out what to do next. However, if I get a bunch that say they would like me to review ballet, it ain’t gonna happen. Salute doesn't have a bar, but that doesn't mean you can't do a bit of serious drinking. It was a bit of a trek for me to get out here to 108th in Rego Park. I took the G line to where it ended in Long Island City and then switched to the V line and took it to Rego Park. 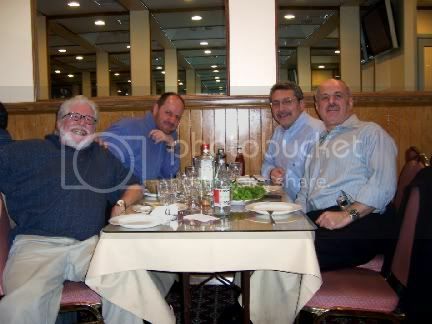 Then, instead of the two blocks that my friend Felix said I had to walk it was twelve blocks from the subway stop. Added to that was the one block back from 98th to 97th to ask for directions and then back to 108th and it was a nice long hike. Of course I got there before anyone else and had worked up a powerful thirst. I wasn't about to break into the iced bottle of vodka I brought with me so I ordered a beer instead. Instead I had a Baltika Extra 9 Lager, a nice Russian beer that packed a bit of a bunch, 8% alcohol, and came in a big, if somewhat unusual sized, bottle, 1 Pint, .9 Ounces. Must be a metric thing. The beer had a very nice flavor that hits you with an initial bitter taste that melts into a sweet, malty finish. It has a nice golden color with almost no head. It is brewed by Pivzavod Baltika / Baltic Beverages Holding in the Russian Federation. Now this is a bit confusing because Doyna LTD is also involved as a company that was established in 1997 to develop and market high quality imported European beer brand in the United States. I think they are just the importer though. Baltika has a wide range of beers, many of them with numbers. Perhaps I shall have the chance to try them all. According to Doyna's website, Baltika is the second larges selling beer in Europe, Heineken being number one. 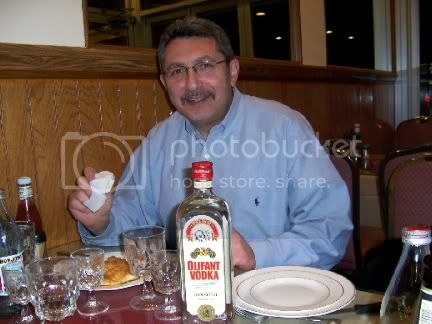 Two of my friends that I was dining with are Russian and when I asked what I should bring to drink it was fairly unanimous, vodka. I picked up one that is made in Texas on the recommendation of my friend at the local liquor store. 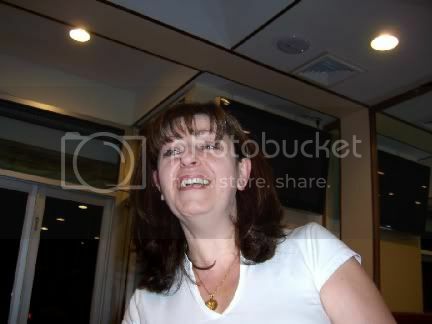 I told him I would get all kinds of static for bringing a Texas vodka and I was right. However, after the first toast everyone agreed that it was quite good. 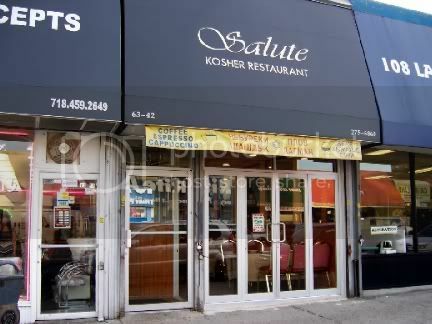 At the risk of making Salute even more popular that it already is, I have to say that the food was delicious. Traditional Russian fare from the salads through the fantastic lamb soup and the delicious shish kabobs. I usually stay away from these unless I make them myself because typically they are over-done and tasteless. These were absolutely delicious. 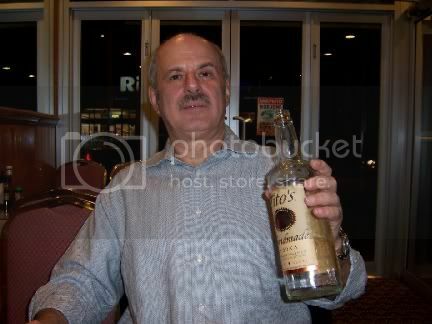 Needless to say a single bottle of vodka wasn't going to do it for this crowd so Al went out and got another. Luckily there was a care service available to get me back home for a mere $35 plus a generous tip.